 Albert G. Ruff (clerk, City Post Office); Sarah J. Ruff (widow of George R. Ruff); Madison Davis (chief clerk, Office of Third Assistant Postmaster General). Albert G. Ruff (clerk, City Post Office); Sara J. Ruff (widow of George R. Ruff); Madison Davis (chief clerk, Office of Third Assistant Postmaster General). Albert G. Ruff (clerk, City Post Office); George A. Ruff (clerk, Post Office Department); Sara J. Ruff (widow of George R. Ruff); Madison Davis (chief clerk, Office of Third Assistant Postmaster General). Madison Davis (chief clerk, Office of Third Assistant Postmaster General). Sarah J. Ruff (widow of George Ruff); Madison Davis (chief clerk, Office of Third Assistant Postmaster General); Dora B. Sims (clerk, Census Office). Sara J. Ruff (widow of George R. Ruff); Ida M. O’Donnell (clerk, 5th auditor); Madison Davis (chief clerk, Office of Third Assistant Postmaster General). Sarah J. Ruff (widow of George Ruff); Madison Davis (chief clerk, Office of Third Assistant Postmaster General); Ida M. O’Donnell (clerk, Treasury Department). Madison Davis (chief clerk, Office of Third Assistant Postmaster General); Ida M. O’Donnell (clerk, Treasury Department); Sarah J. Ruff. Madison Davis (chief clerk, Office of Third Assistant Postmaster General); David Wolfe Brown (reporter, House of Representatives). Madison Davis (chief clerk, Office of Third Assistant Postmaster General); Sarah J. Ruff (widow). 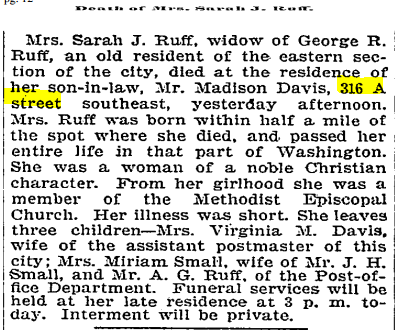 Sarah J. Ruff (widow of George R. Ruff); Madison Davis (Assistant Postmaster). 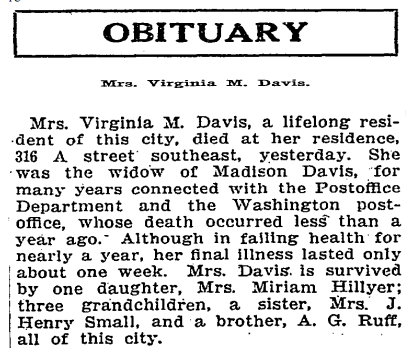 Miriam Davis; Madison Davis (Assistant Postmaster). Madison Davis (Assistant Postmaster); O. H. Leland (Coast and Geodetic Survey). Madison Davis (Assistant Postmaster); C. Sherman Hillyer (clerk); Howard W. Portch (Library of Congress). 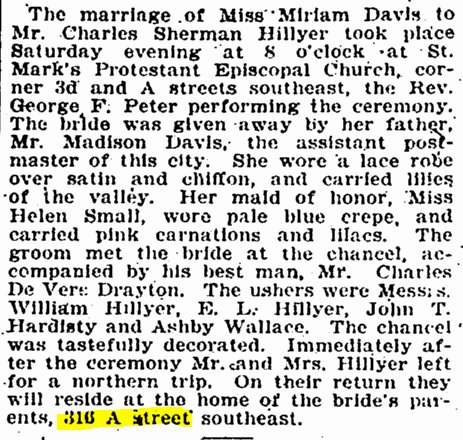 Charles S. Hillyer (clerk); Madison Davis (Assistant Postmaster, Washington City Post Office). Charles S. Hillyer (clerk); Madison Davis (Assistant Postmaster). Madison Davis (Assistant Postmaster); Kate Powell (domestic). Madison David (Assistant Postmaster); Merriam Hillyer; Kate Powell (domestic); Madison Davis (superintendent, Station B [4th and E. Capitol], Post Office). 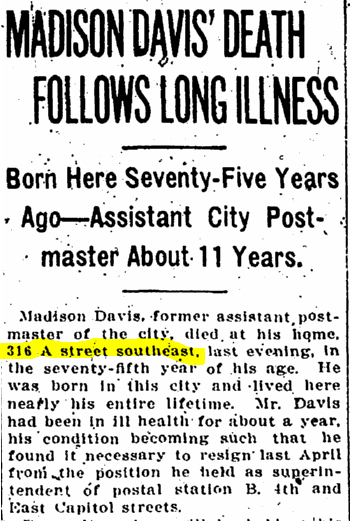 Madison Davis (superintendent, Station B [4th and E. Capitol], Post Office). 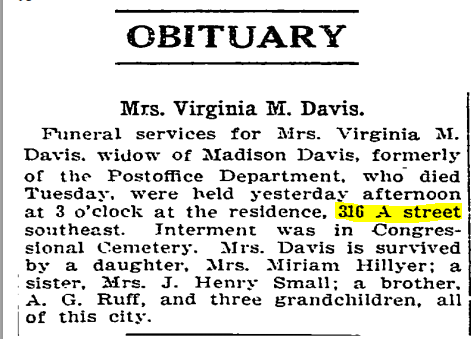 Virginia M. Davis (widow of Madison Davis). 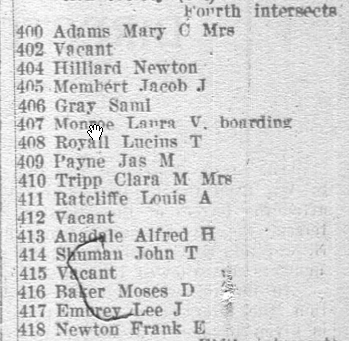 Daniel O’Hara (clerk, boards); Mirian [sic] D. Hillyer (widow of Charles S. Hillyer, boards); Mrs. Virginia M. Davis. Charlotte Davis (clerk, General Post Office). Herman W. Davis; Carl E. Raymond. Herman W. Davis (watchman, Post Office). Margaret Murphy (widow of John A. Murphy); Lottie Davis (clerk); Herman W. Davis. Herman W. Davis; Richard Allen; Clara K. Bragdon. Richard Allen; Clara K. Bragdon. 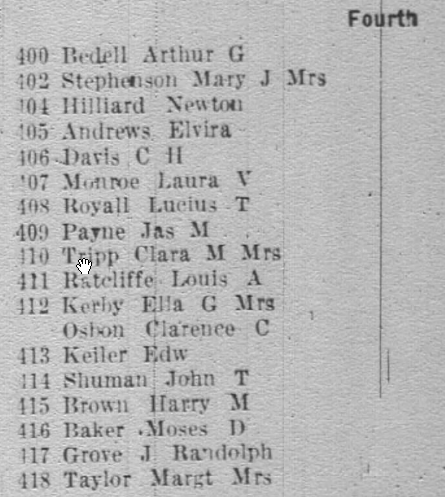 Richard A. Allen; Mrs. Martha E. Payne. 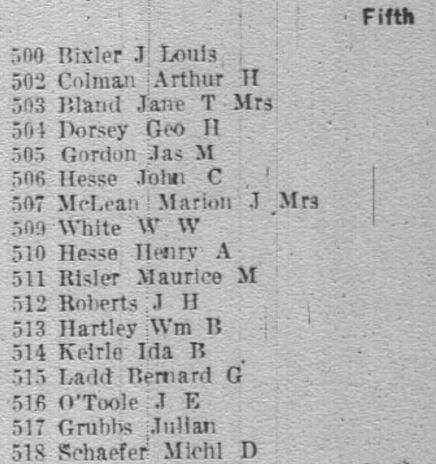 Richard A. Allen, Mrs Martha M. [sic] Payne. Richard A. Allen; William Keeler. Edwin C. Fowler (chief clerk, First Assistant Postmaster General’s office); Mary E. Fowler (clerk, Pension Office); Minnie E. Fowler (clerk, Pension Office); Robert W. Fowler (clerk, city post office); A. Estelle Fowler (teacher). Mary E. Fowler (clerk, Pension Office); Robert Fowler (clerk, city post office). Rudolph Kleberg (House of Representatives, Texas). Frederick A. Wallace (student); Frederick R. Wallace (clerk). Llewellyn Cook (paper); Vernon W. Ashby (inspector). 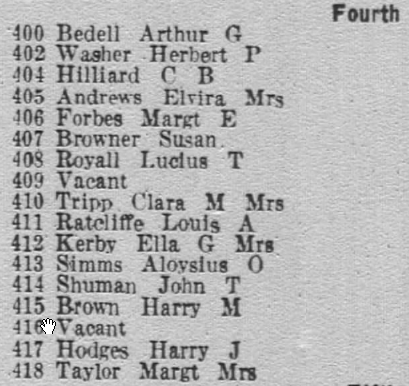 Gertrude Ashby (clerk, Post Office Department); Vernon W. Ashby (inspector); Llewellyn M. Cook (Cook, Bernheimer & Co.). Vernon W. Ashby (secretary); Llewellyn M. Cook (Cook, Bernheimer & Co.). Gertrude W. Ashby; Harriet Ashby (widow of V. W. Ashby). Warren Barnes (clerk); W. J. Barnes (clerk); Charles G. Buettner (bookbinder; Frederick A. Kennedy (Navy Yard). Thomas H. Clark (reporter, U.S. Court of Customs Appeals); Samuel Gray (inspector); C. W. Timmons (assistant manager, Boston Bakery). Samuel Gray (inspector); Charles W. Gwynne (Navy Yard). 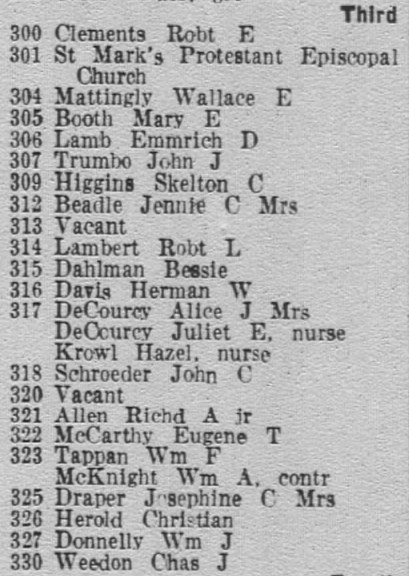 Frank W. Kimball (machinist); Margaret E. Forbes (teacher). 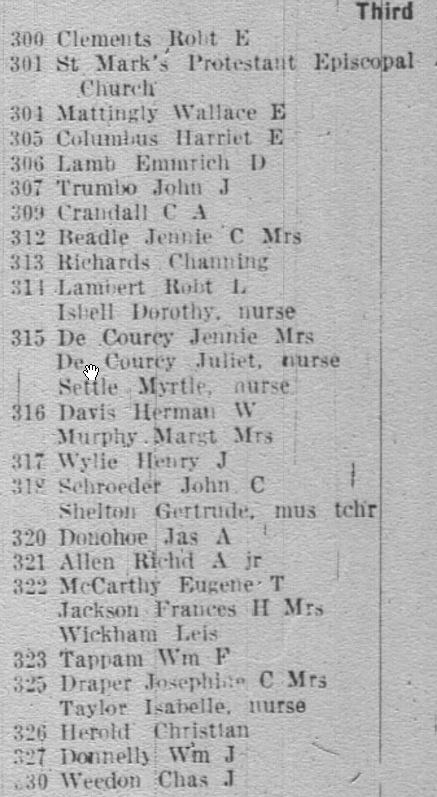 Mrs. Josephine F. O’Meara (skilled laborer, GPO). Clinton H. Davis; Marie English (clerk, Department of Commerce); Josephine M. Forbes; Margaret E. Forbes (teacher). Clinton H. Davis; Margaret Forbes. John H. Carmiencke (clerk, Advocate-General’s Office); Michael A. Dillon (clerk); Dr. Lawrence Wilson. David H. Goodno (clerk, Land Office); Charles Goodno. David H. Goodno (clerk, Patent Office). William W. Chase (machinist); David H. Goodno (clerk, General Land Office). David H. Goodno (clerk, General Land Office). David H. Goodno (clerk, General Land Office); William Chase (machinist); Maria Taylor (cook). David H. Goodno (clerk, General Land Office); William W. Chase (conductor). David H. Goodno (clerk, General Land Office); William W. Chase (machinist); Maria Taylor (servant). Ann M. Taylor (domestic); William W. Chase (machinist); David H. Goodno (clerk, General Land Office). William W. Chase (machinist); David H. Goodno (clerk, General Land Office); Maria Taylor (domestic). William W. Chase (machinist); David H. Goodno (clerk, General Lane Office). Richard F. Jones (salesman); William C. Simpson (salesman). Nettie Cross (Bureau of Printing); Denetta L. Cross (Bureau of Printing); Louis Green (clerk); William Brashears (grocer). William B. Brashears (clerk); Louis Green (clerk). Boyce, Mabel E. (clerk); William B. Brashears (clerk); Louis L. Green (clerk). Harry A. Severn (machinist); James S. Severn (machinist). Robert J. Fitch (messenger); T. R. Davis (machinist). Thomas R. Davis (machinist); Marion D. Finch (carrier, Post Office); Robert J. Fitch (messenger); Reed K. Middleton (Navy Yard). 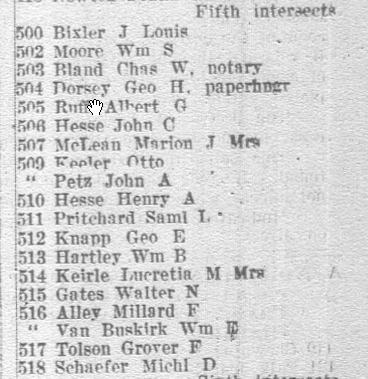 Marion D. Finch (carrier, Post Office); J. Louis Bixler (clerk. Commerce and Labor Department); Harry W. Kelley (machinist). J. Lewis [sic] Bixler (Commerce and Labor Department); John N. Bixler (Pension Office). J. Louis Bixler (Commerce and Labor Department); John N. Bixler (clerk, Pension Office). J. Louis Bixler (Bureau of Immigration); John N. Bixler (Pension Office); John C. Hesse (division chief, War Department). J. Louis Bixler (Commerce and Labor Department); John N. Bixler (clerk, Pension Office). J. Louis Bixler (Commerce and Labor Department). J. Louis Bixler (clerk, Department of Labor). J. Louis Bixler (assistant chief clerk, Department of Labor). J. Louis Bixler (examiner, Department of Labor); Mary E. Bixler (clerk). J. Louis Bixler (examiner, Department of Labor). 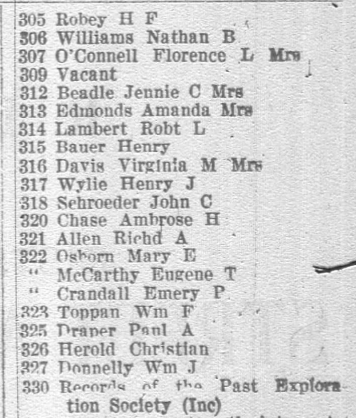 Washington Evening Star, 1 August 1913, p. 3. 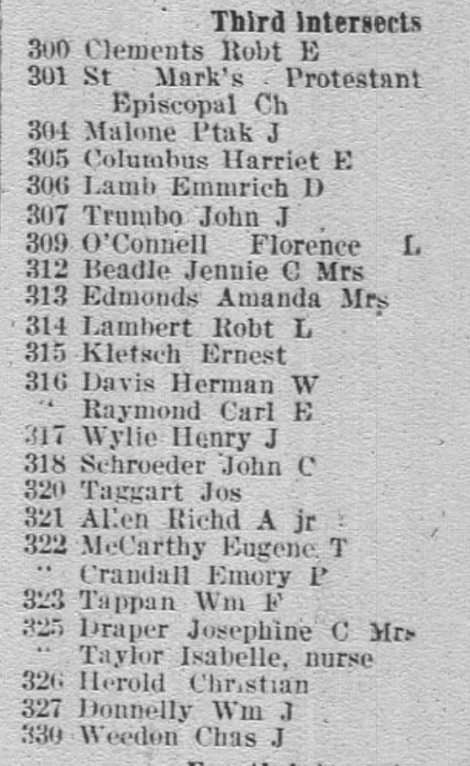 Washington Evening Star, 31 July 1913, p. 7. 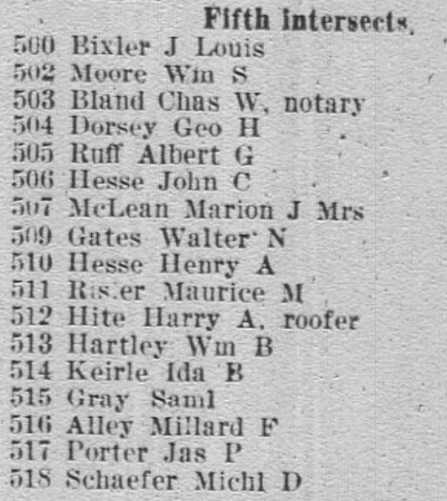 “Automobile Licenses.” Washington Evening Star, 1 June 1913, p. 27. 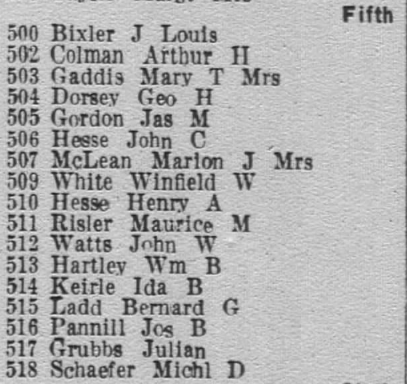 “The World of Society.” Washington Evening Star, 8 February 1904, p. 5. 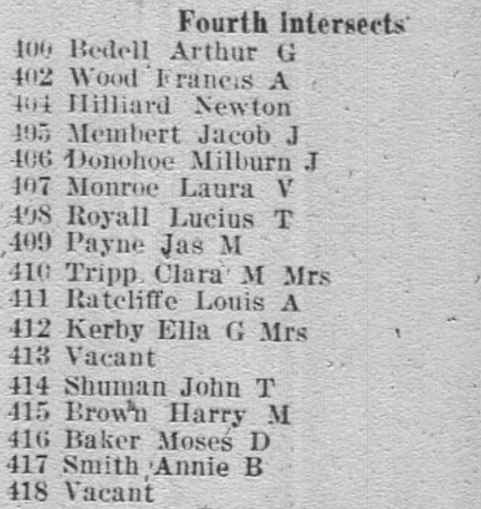 Washington Post, 17 June 1914, p. 3. 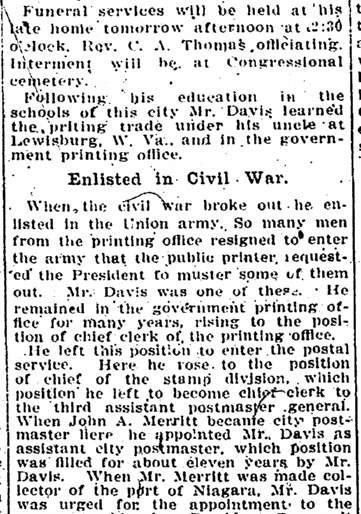 “Died.” Washington Post, 1 August 1913, p. 3. 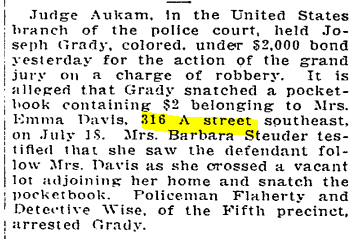 Washington Post, 3 March 1901, p. 12. 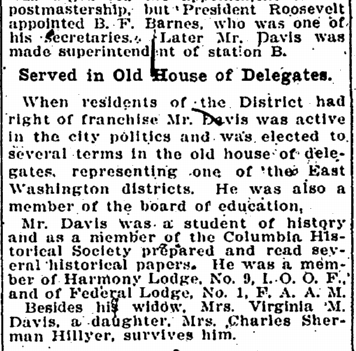 Washington Post, 19 June 1914, p. 2.